A drone, also known as an unmanned aerial vehicle (UAV) as well as many other names, is a device that will fly without the use of a pilot or anyone on board. These ‘aircraft’ can be controlled remotely using a remote control device by someone standing on the ground or by using computers that are onboard. UAV’s, in the beginning, were typically controlled by someone on the ground but as technology has advanced, more and more aircraft are being made with the aim of being controlled via on-board computers. The idea of an unmanned aerial vehicle can be traced back to early in the twentieth century and was originally intended to be solely used for military missions but have since found a place in our everyday lives. Reginald Denny, who was a popular film star as well as an avid collector of model airplanes was said to produce the first ever remote piloted vehicle in 1935. Since this date, the aircraft have been able to adapt to new technologies and can now be found with cameras as well as other useful extras. As a result of this, UAVs are used for policing, security work and surveillance and firefighting, they are even used by many companies to check on hard to reach assets such as piping and wirework adding an extra layer of safety and security. The rise in popularity of these devices has, however, brought some negatives as well as positives as new rules and regulations have had to be introduced to control the situation. As the UAVs were getting stronger and technologies were improving, it meant that they could fly higher and further away from the operator. This has led to some troubles with airport interference all over the world. In 2014, South Africa announced that they had to tighten security when it comes to illegal flying in South African airspace. A year later and the US announced that they were holding a meeting to discuss the requirements of registering a commercial drone. As well as the previously mentioned uses, drones are now also used for surveying of crops, counting animals in a certain area, looking over a crowd among many others. Drones have managed to change the way that many industries are run and have also allowed many businesses to become more efficient. Drones have also helped to increase safety and also contribute when it comes to saving lives. Forest fires and natural disasters can be monitored and the drone can be used to alert the relevant authorities of anyone that is in trouble and in need of help. The exact location of these events can also be found with ease. 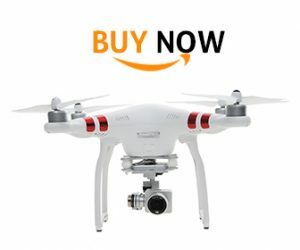 Drone Prices – How Much Should I Expect to Pay for a Drone? Firstly, you have to consider exactly what it is going to be used for. Is this going to be your first drone that you will use every now and then? Are you somewhat of a professional that likes to fly drones on a regular basis? Once you have considered all of the above, prices will vary depending on your answers. DJI is one of the most well-known company’s when it comes to quadrotors and has a great reputation. The ‘Phantom 3’ is their most popular product and in many people’s opinion, the best. The Phantom 3 offers live HD streaming, 12-megapixel photos, a detailed app as well as 20 minutes flight time. You can currently find this particular drone at around $1200. It is notoriously easy to fly making it perfect for beginners. Also from DJI is the ‘Inspire 1’ which offers a lot of the same features and more. This quadrotor is twice as big and twice as fast as the Phantom 3 and also includes a 360-degree camera that can be rotated completely independent from the aircraft itself. As a result of this, it is the perfect drone for professionals in photography and video. This model is also used for search and rescue and is available for just under $3000. Despite the price, this drone remains fairly easy to fly as with most DJI products. If you wanted something away from DJI, the Yuneec Q500 4K offers something slightly different. As the name suggests, the camera shoots 4k video and is also detachable from the quadrotor so can be used as a handheld device. The company isn’t as well-known as DJI so their products aren’t as popular but they still offer a great drone and one that should be considered at around $1300. Don’t be over-awed by the many options available to you, use it to your advantage instead. Once you have it clear it in your head what you want, you will find many options that range from less than $100 to $2000+. You can also find drones that will last around 5 minutes compared to those that will last 25 minutes. Drones come in all shapes and sizes; why not spend some time looking for the perfect one for you. Remote control drones are now also being used in many industries making them more efficient with a little investment; many oil and train companies, for example, use remote controlled drones to help fix any problems that may occur on a day-to-day basis. A train company may use a drone to find out exactly where a part of the track may be broken. An oil company may fly a drone out in the sea to find the exact cause and location of an oil spill. Such is the advancements in technology; underwater drones are now becoming more popular because of their ability to dive deeper into the sea than any human meaning that we can access never before seen areas to conduct research. All these models of drone can end up saving lives as they are completing jobs that may be unsafe for the company’s workers. Although the handheld devices have changed to an extent, the communication methods that the drone uses have changed even more. GPS is now included on many models, this allows the user to know the exact location of their aircraft as well as set out a planned route. This can come in great use as the drone will only have a certain amount of flight time so you can plan a route keeping in mind that it will have to return to you after 20 minutes, for example. Wi-Fi can also be found on many devices which allow direct communication between the drone and the user via mobile/tablet applications. The video taken from a drone can now be live streamed to the internet as a result and was put into practice by a New Yorker who live streamed the Wall Street protests to hundreds of thousands of people watching from home live streamed also adds another layer of communication. Finally, the iOS/android apps have grown in popularity in recent times and now boast many benefits including; flying the drone (once linked up), changing certain camera settings to ensure you get the best possible picture quality as well as in-flight telemetry. These devices normally use two different sets of propellers; one set of two will go clockwise with the other set going counter-clockwise. This keeps the device stable when in the air and able to quickly change direction in all conditions. Due to the success of the drones, production actually began on a larger scale version of the quadcopters but ultimately ended in failure. At first, many people believed that a helicopter would benefit from the counteracting rotors instead of the front rotor and the rear vertical rotor (which actually produces little lift and therefore little help to the taking-off process). Many test vehicles appeared around the world in the early to mid-1900s and were, at first, a success and were many of the early vertical take-off and landing (VTOL) aircraft. However, this soon came to an end after many problems including poor and inconsistent performance. An improvement was thought to have been made a few years later only to suffer again as the workload of the pilot became too heavy. Many years ago, attaching a camera to a drone would have been a ludicrous idea to simply put, would not have been possible. However, dramatic advancements in technology have now meant that small yet powerful cameras are now built-in to most drones that are available on the market today. Although you can still find quadrotors without a camera, it is rare and most do include a high-quality option for both pictures and video. Because of the addition of cameras to drones, the industry is now huge and growing ever more popular every single year. In 2014, the well-known drone manufacturer, DJI, introduced HD to their drones and the game was changed forever. The quadrotor was also equipped with a three-way gimbal which keeps the camera steady during rough weather conditions as well as the vibrations of the drone itself. As a result, drones are now being used worldwide for a number of tasks including film production and crowd control. If you are still picturing a photograph from a drone to be from a ‘fisheye’ point of view then think again. DJI’s Phantom 3 is one of the most popular choices of drones for photographers because of its high-quality camera and 94 degree field of view (non-fisheye). The new Phantom 3 also includes features that can be found on some of Sony’s most popular camera products and the pro version even allows the user to shoot 4k video at up to 60fps. This is the same as can be found on Phantom 3’s sister product, Inspire 1; the Inspire 1 offers more extras and is, therefore, more expensive. With the Inspire 1, you will also be benefitting from the increased control with which you can fly and therefore take pictures as well as a 360-degree gimbal. The Phantom 3 gimbal can only be turned 90 degrees to 30 degrees which mean that the drone itself has to be moved in the direction that you want to shoot. A 360-degree gimbal removes this necessity and can even be controlled independently of the drone by a second remote control. The 3D Robotic Solo (3DR) is thought to be the two aforementioned products’ biggest rival in the camera department as it allows the user to shoot in HD and stream to a chosen mobile phone or tablet. The 3DR also includes a detailed app where you can access the drone’s in-flight telemetry as well as adjust the settings to your personal preference. The 3DR does differ slightly in that it uses a GoPro camera rather than an own-brand device; this means that you will get a slightly more natural fisheye look which can be altered in editing but is something that should be noted if you are unsure of which one to buy. Despite this, the 3DR offers an array of options on the app via a segment called ‘smart shots’ that allows you to get the perfect shot that you require. This is a unique function and maybe the reason why they are starting to compete with the big boys in the industry. So those are two of the best camera options when it comes to drones but there are many other options in-between so why not have a search and see what ones stand out for you? DJI, a Chinese company founded in 2006, is the market leader in recreational drones and is set to hit $1 billion in revenue next year. With a product range that includes the Phantom 3 and the Inspire 1, their products are widely used around the world in a number of different industries including farming and policing. DJI’s devices have also been associated with the solution to many natural disasters as drones can be used to hunt for hurricanes or search for the cause of a forest fire and help to keep the fire under control. Their products now offer customers high-quality photo and video recording abilities, efficient GPS systems, and application support. An app provided by DJI allows its customers to change settings on the drone to ensure the highest possible picture quality, stream 4k (60fps) video straight to an iOS or android device and access in-flight telemetry. Parrot is a company based in France that has completely changed the game when it comes to remote controlled aircraft. They have produced a drone that is propelled and kept up with no fewer than four rotors (quadcopter) that is operated using the latest mobile and tablet technology. The Parrot AR. Drone allows the user to control the vehicle using an application that can be found on both android and iOS; there is also other software available for other phones/tablets. The first version to be released by Parrot was the 1.0 in 2010. It was shown off to a large crowd at the consumer electronics show in Las Vegas during a demonstration using the relevant mobile application. The device was a little over 22 inches across and was made up of mainly carbon fiber and nylon. The device included detachable hulls that could be changed according to whether you were flying inside or outside. The indoor hull provided the blades with extra protection via foam coverings reducing the likelihood of causing permanent damage. The outdoor hull was different to this in that it was made of plastic and allowed for easier movement. In 2010, the Parrot AR. Drone won the award for ‘electronic gaming hardware’ at the consumer electronics show’s innovations ceremony and nearly 500,000 sales have followed to this day. Much praise also came in for the second release for its ease to learn compared to the first release which took a lot longer to become adequate at flying. Since its introduction, Parrot’s drones have been widely used including at sporting events to increase coverage as well as for streaming other events. One man even attempted to live stream the pictures from his drone of the Wall Street protests to viewers from around the globe. Directly from this, he has begun development of installing a 3G device inside the drone that will allow for connection via the internet that would mean a much wider reach rather than using a Wi-Fi point nearby. The first step to building your own drone is to decide on what design you wish to emulate, this will, in turn, decided the parts that you will need. Do you want speed? If so, you need to build a fixed-wing drone. However, if you wanted precision then a multi-rotor drone is what you require. If you choose to build a multi-rotor, your options then increase again as there is many different shapes and designs to choose from. You can decide to have an ‘x’ shape, a ‘+’ shape or even a ‘y’ shape with two propellers on each arm. The next step is to choose the base of your drone. Many years ago, sensors were not quick enough to react to the push of a button but with the advancements in technology, there is now many to choose from. Many different manufacturers offer a central, focal point to your drone that specializes in navigation as well as altitude (through the pressure sensors). You need to choose a system to your drone that best represents what you are trying to achieve, whether it is stability whilst in flight or speed. There will be a circuit board in this device that will react to your hand-held device with which you wish to fly the drone with. If you are willing to invest the money, you will also find mainframes that will allow you to pivot the camera (once installed) up and down as well as send the video down to a device on the ground via Wi-Fi or any other internet connection. As previously mentioned, if you wanted a camera on the drone, this will also need to be integrated into the system. So now you have the heart of your drone, you have the electronics, the sensors, the camera and all the wires that are going to make this thing work but now you need to create a frame. You need to choose a material that will be resistant to damage but also hides away the main system; you want to keep all the wiring hidden from view. Carbon fiber is one of the most popular materials for drones as it is light yet extremely strong. It is also great for reducing the vibrations which will improve your drone’s ability to remain steady whilst in the air. With the commercial drone industry booming and currently growing by nearly 20% each year, there are now an unprecedented amount of drone kits that are available to you depending on your need. Thanks to heavy levels of research and development, drones can now be purchased for an affordable price whilst still maintaining a high-quality design and a number of useful features. As a result of the booming industry, drones can be bought from just about anywhere in the world from a number of major online retailers. The main stores of this kind are based in the US as well as China but offer to ship around the world. You may be able to find a retailer closer to you if you search a little but you can’t go wrong with a big name. Hobby King is one of the biggest names when it comes to drones and for good reason too. They manufacture their own products, have permission to manufacture others as well as sell some of the biggest brands available. While the thousands of options are great from a consumer point of view, you also have to remember that some parts or even drones themselves may not be that good in quality so remember to check the reviews before you make a purchase. RCGroups.com also offers a wide selection of products in its ‘classified’ section. This is where people can put their drones/parts up for sale creating a market for the products. Again, you have to be careful with this one as there may be scammers (as there is everywhere online) so be sure to talk to the seller and maybe even view the desired product for yourself. There are also many other fantastic sources for drones and drone parts including DJI, quadrocopter.com, and amazon. Just remember to stay safe when purchasing online and do not pay out money in a situation where you feel uncomfortable.